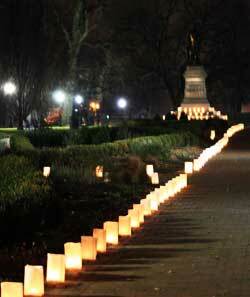 The area known as German Village today was laid out as South Columbus in 1841. 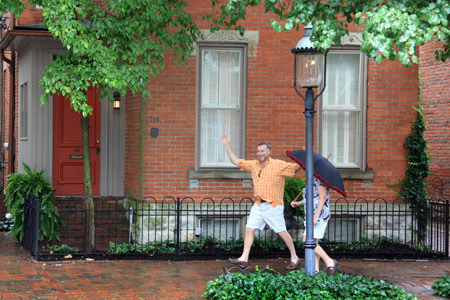 The name German Village is due to the significant German immigrant population that settled in South Columbus, the largest arriving between 1840 - 1860. By 1900, 1/3 of the Columbus population was of German descent. At that time, the south side of Columbus was separated from the rest of the city by a large ravine that ran just about where I-70 is today. The land there was extremely cheap because of this gap and became very attractive to the poor German immigrants coming to the area. They developed a community they called "The Old South End." This German community thrived in an area that was unacceptable to most people of the day. Nearby tanneries used for processing leather for the many buggy manufacturer's in the area created a very unpleasant odor that lasted year round. The Scioto River had become a dumping ground and during the dry days of summer, the stagnated water made the area almost uninhabitable. But the industrious Germans made the best of a bad situation. One of those things was brewing beer. The Germans living on The Old South End built great breweries and the area thrived for many years. When pasteurization became feasible along with refrigerated rail cars, local breweries found it difficult to compete with the larger breweries and they were forced to close. World War I brought intense anti-German sentiments and all things German were distrusted. Sauerkraut was called Victory Cabbage. Even German street names were changed. This marked the end of an era for the unique German culture that existed on the South Side. In the late 1950s, Columbus was undergoing extreme renovation. Large portions of the downtown area were being torn down to make way for new projects. This was called the Market Mohawk renovation in which 60 acres of south central Columbus was leveled and laid out for new development. This was about the same time that the interstate was built through the downtown area. After years of neglect, the 1960s marked a new resurgence of German Village interest. 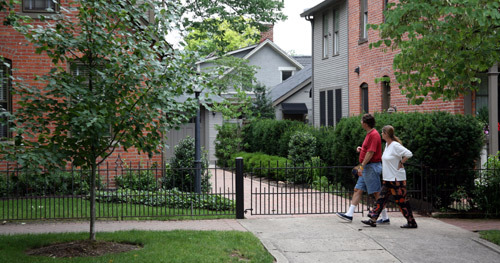 Led by Frank Fetch, a small group of neighbors worked hard to designate German Village as a protected Historic Preservation District to protect the area from the wrecking ball that had been so efficient at removing other older neighborhoods in the Market Mowhawk area just north of German Village. 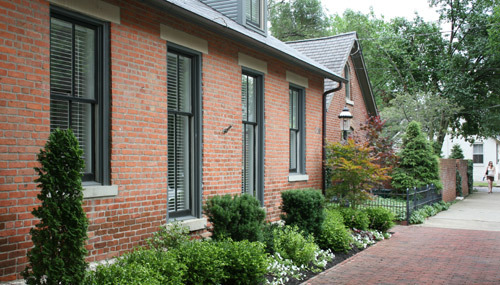 In 1960 The German Village Commission was formed to preserve the area and German Village was officially designated on the National Register of Historic Places in 1974. The best way to see German Village is to park the car, and walk. The brick streets are narrow so driving around can be problematic, but walking is great. Each house is unique and there's a great mix of obviously restored houses. As you walk through the neighborhood, you'll see some obvious reminders of the Village's history. For example, you might see blocks of stone sitting at the end of the sidewalk leading out from a house. These were step-ups used to climb into horse-drawn carriages in 1800s. You might also note posts along the street where homeowners could tie up their horses to keep them from wandering off. 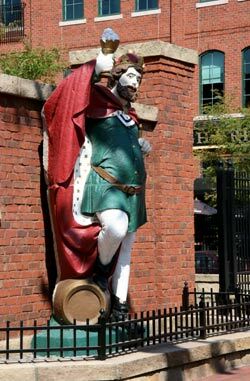 Tourists flock to this privately-funded historic district, especially to Schiller Park and its open-air Shakespeare performances. The area's distinctive look is created by brick streets, wrought-iron fences and not-exactly-German architecture: buildings with Queen Ann and Italianate features, story-and-a-half brick cottages and Dutch Doubles. Yards are small, but residents have created elaborate gardens that make the most delightful scenes in such small areas. There's really few other places in the midwest that rival the scale of this elegant neighborhood, with its brick streets and well kept gardens. There are also several guesthouses where visitors can spend the night. One of the main industries that residents of German Village worked at was brewing beer and they lived almost next door to the companies. What is now called the Brewery District (the area directly west of German Village and High Street) is where the breweries were built. Although brewing beer was the main business, there were other businesses such as fertilizer processor. Today the Brewery District has refurbished many of the old factories and warehouses and turned them into upscale Condos, eateries and pubs. The Brewery District is a special blend of yesterday and today combining preserved architecture with newer, funky entertainment venues to create a great place to go for the day or spend an evening out with friends. The Brewery District complements the charm of German Village by offering great entertainment with its small micro-breweries that operate in the old-world tradition, fine restaurants, a winery, retail shopping and a summer concert venue. While the Brewery District has definitely settled into middle age compared with the newer, livelier Arena District, the Brewery District has its own distinct flare and offers a quality of urban life-style that is a bit slower, but has become more of a community of like minded residents. With the Whittier Street Peninsula gearing up for a major renovation, the Brewery District will find itself a major player on the south side entertainment scene for many years to come. The Brewery District also offers living spaces in converted warehouses that are actually less expensive than Downtown condos, with definitely less rambunctious than the Arena District or Short North, plus, it's easier and cheaper to park, too. 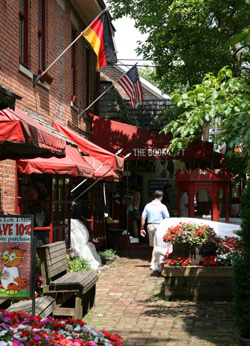 Besides the unique architecture associated with German Village, there are also some unique dining opportunities, some excellent drinking establishments including some local micro-breweries. 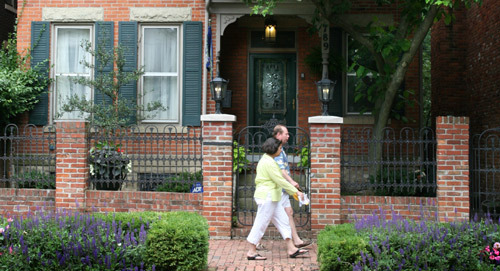 German Village opens its doors and garden gates for a celebration of innovative design and award-winning restorations. Guests are cordially invited to explore the homes and gardens open for touring, enjoy gardening demonstrations, and shop for unique home and garden accessories in Marketplatz. Tickets are $15.00 in advance and $20.00 day of tour. Tour homes usually are located throughout the village and do require a good bit of walking. Some homes are open with both gardens and a tour of the first floor which usually means coming in the front door, going through the living room, kitchen, dining room and out the back door. Lines can be long at the tour homes. Parking can be a problem, but there are several public parking spots with shuttle service. There is also various shuttle stops where you can get a ride to the next stop. 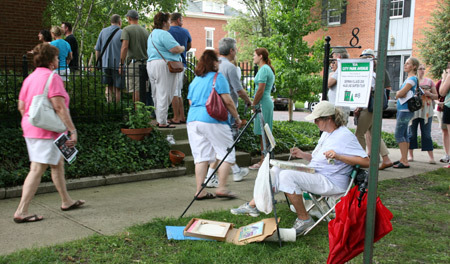 The German Village Haus & Garden Tour is usually the last Sunday in June. Stroll down the luminaria lighted streets of German Village and paths of Schiller Park in a Winter Wonder in early December for the Village Lights celebration when more than 10,000 luminaries light up the streets of German Village while the merchants roll out their welcome with specials and live entertainment— enjoy carriage rides, visit with Santa and his reindeers, and meet Pelznickle. The celebration is usually held the first Sunday in December from 6 - 10 p.m.
No visit to German Village is complete unless you dine at Schmidt's Restaurant and Sausage Haus. They have been serving Columbus and it's visitors since 1886. This is a family restaurant and the menu is heavy on the sausage, but lighter fare is also available, and save room for one of their world famous Jumbo Cream Puffs. You won't regret it.